Cotton is an important annual plant from which the vegetable fiber of commerce is grown. The different varieties are natives of the tropical parts of Asia, Africa, and America, but are now grown far into temperate zones. 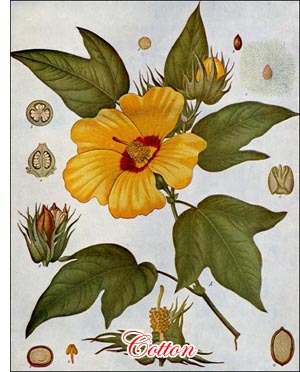 The fruit is a three to five celled capsule, springing open when ripe, and containing many seeds wrapped in cotton fiber, one to three inches long, which constitute the cotton of commerce. The best is the long staple silk cotton known as Sea Island cotton, which is grown principally on the islands and coast of Georgia, South Carolina, and Florida. The finest kinds of cloth are spun from Sea Island and Egyptian cotton. Cotton is also combined with silk, wool, linen, or alpaca in the manufacture of certain kinds of goods. The most perfect system of cultivation is now used in the United States, where most of the cotton of the world is raised. The seed is usually planted in March in furrows. Blooming occurs early in June, and picking usually begins in August and lasts until the frost stops further growth of plants. It is dried and ginned, or separated from the seeds, and packed ready for shipment. The process of separating seed from fiber was formerly done by hand, but the invention of the cotton gin by Eli Whitney in 1793 revolutionized the cotton industry. Formerly the manufacture of cotton in the United States was confined almost exclusively to the New England States, but of recent years thriving factories for the coarser grade varieties have sprung up in the South, and this industry is rapidly growing in importance. Besides cotton fiber, other by-products of the cotton industry are of great importance. Cotton seed is rich in oil, which is now extensively used in making lard and in other ways. Cottonseed cake is also used as a cattle food and the cottonseed meal is also becoming an important article of food. Pulp is now also successfully made from the cotton stalks, from which is made the finest of writing paper, etc.